In honor of Memorial Day this year, Kegenix wanted to share with you some inspirational stories, from a few of our favorite veterans. One of those veterans is Ben Davis. 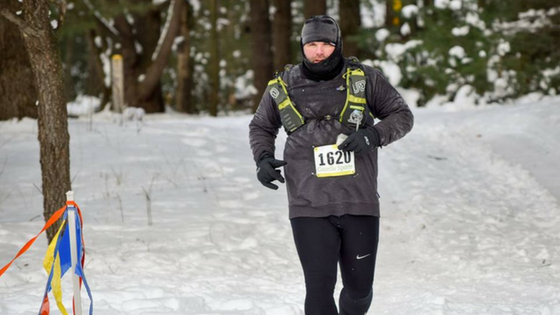 Here is his story about how he was able to, not only lose 150 pounds using the ketogenic diet, but go against what his doctors thought possible and compete in 5 ultra-marathons so far this year. And he's not slowing down. 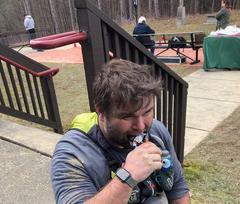 His goal is to complete one ultra-marathon per month, for all of 2018. When I decided to try the keto diet 15 months ago, I had no idea where it would take me. Best case scenario for me was to maybe lose 30-40 lbs. and then figure out what to do next. The idea of running wasn’t on my mind and being an advocate for veteran’s health was a pipe dream. In my mind, I was still the elite level athlete that I was before my time in the army and that door-kicking, ground-pounding, knuckle-dragger that I was in the army. Sure I could still lift heavy things, but that is not indicative of health or fitness. I would lift heavy because it fit my image, looking more like a power lifter than anything else. With job changes and life changes, my training also changed. The little time dedicated to lifting heavy things went away as well. I slowly began gaining more weight over time and with every pound lost, I would gain it back with interest. Dealing with chronic pain from a laundry list of injuries from my time in the army didn’t help either. I had hit a low point. It was not long after that I heard about the keto diet through a podcast. I did have a little familiarity with the diet as a complimentary treatment for epileptic and cancer patients, but not for general health and weight loss. I did my research and the science behind it made sense to me. I thought that I would try it for 45 days or so, which was usually how long I could sustain a diet or training plan. So with nothing to lose, I started my keto journey. That was 15 months ago. I would like to say that it has been the most challenging thing that I have done, but it really isn’t. It’s actually been really easy. I started this journey thinking that I would lose 30 lbs. or so without knowing if it was going to be sustainable long-term. To date, I’ve lost over 150 lbs. and I’m continuing to lose weight. The ketogenic diet is not just about losing weight or reversing metabolic syndrome and type 2 diabetes. It can help with pain management through reduction in inflammation, it can help with managing PTS and TBI. As a veteran with a PTS and TBI diagnosis, one of the side effects of the ketogenic diet is that I no longer deal with any of the side effects of those issues. Also, my chronic pain has gone away. The ketogenic diet isn’t the solution to every problem that you deal with, but it can be a starting point. "I was told by military and VA doctors that I would never be able to run, so I thought the best way to prove those doctors wrong would be to run." In an effort to draw awareness to this, I wanted to do something that would make people take notice. 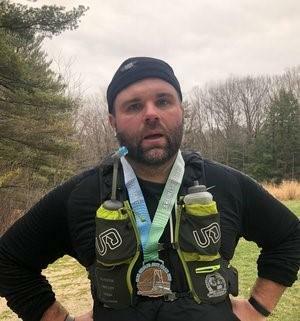 I was told by military and VA doctors that I would never be able to run, so I thought the best way to prove those doctors wrong would be to run. I thought about running a marathon and then it dawned on me that a lot of people run marathons. If I wanted to really draw awareness to what I was doing, I would need to do something bigger than that, so I decided that I would run, not just one ultra-marathon, but one ultra-marathon a month in 2018 and doing it using fat based, ketogenic fuel sources. It is now May and I’m getting ready for my fifth ultra this year and I have done it using fat based fuel. In addition to the ultra-running, last year I started a podcast and website/blog to share my journey, as well as to provide resources for veterans and the community about low-carb, high-fat or ketogenic diets, training and exercise, and healthy living, with the eventual goal of attaining 501C3 status. My website is www.arsenalofhope.org and the podcast is Arsenal of Hope, available on iTunes, Google, Stitcher, Podbean , etc. You can also follow me on IG and Twitter (@arsenalofhope) and on FB (@thearsenalofhope). To read the full article on Ben, click here!